By Kiannah Sepeda-Miller on Sunday, April 7th, 2019 at 3:00 p.m. In February, state Rep. Brad Halbrook of Shelbyville, south of Decatur, filed a House resolution that, if passed, would "urge the United States Congress to take action to declare the City of Chicago the 51st state of the United States of America and separate it from the rest of Illinois." "The City of Chicago is often bailed out by taxpayers in the rest of the State, such as the $221 million bailout for the CPS pension system that was signed into law," it reads. Former Gov. Bruce Rauner made a similar claim in 2017 as he and lawmakers battled over a plan to overhaul the way the state funds public schools. Although he eventually signed off on the plan, Rauner argued at the time it contained a "bailout" for Chicago Public Schools, in part because it included $221 million to help CPS cover the employer share of its teacher pension costs. We rated Rauner’s claim False, noting the state long subsidized the costs of teacher pensions for every other Illinois school district but Chicago. Halbrook’s resolution goes a step further by contending the state is "often" footing the bill to break Chicago out of financial binds at the detriment of Downstate taxpayers. That’s a pretty tall order — and one the facts don’t even come close to backing up. We reached out to Halbrook, but he didn’t point us to any other cases he saw as bailouts beyond the pension help plus other aspects of the state’s school funding law he thinks give Illinois’ largest school district "extra money." "It’s clearly not true in any fact-checking [sense]," said John Jackson, a professor emeritus at Southern Illinois University in Carbondale. "It’s a very popular claim in Downstate Illinois and the further south you go, the more insistent it is." Historically, those complaints have sometimes centered on transportation funding, something Jackson’s economic analysis did not include. Decades ago, western Illinoisans dubbed their region "Forgottonia" and one foghorn-voiced lawmaker from that region famously roamed statehouse halls bellowing the name of the state transportation director in a comic attempt to draw attention to a demand for more road money. Moreover, other experts we spoke with described Halbrook’s claim as "total nonsense" and dubiously "grounded in any kind of reality." One even called it a myth. "I think it’s very unfortunate that these politicians continue to pander to what amount to myths," said Mike Lawrence, a former director of the Paul Simon Institute who served as press secretary and senior policy advisor to Gov. Jim Edgar, a Downstate Republican who led Illinois for most of the 1990s. "They talk about urban myths, and there may be such a thing as rural myths as well." "That doesn’t mean that every dime that goes to Chicago is justified," Lawrence added. "It also doesn’t mean that every dime that goes to Downstate is justified. But overall, the strength of the state, the ability to provide education and other services to people in the state are reliant on all sectors of the state." "This was more of a symbolic co-sponsorship for me," said state Rep. C.D. Davidsmeyer of Jacksonville, the assistant House Republican leader. "I didn’t write it. If I had written it, I probably would have written it a little differently because I do believe facts and reality are important." Davidsmeyer, however, said he thinks lawmakers need to have a serious conversation about the "Chicago-style policies that keep getting pushed down on the rest of the state." Halbrook’s resolution claims that "the City of Chicago is often bailed out by taxpayers in the rest of the State," pointing to the funding CPS received in 2017 to help cover its pension costs. Halbrook also upped the ante by contending the money for CPS wasn’t an isolated incident, with the state "often" throwing a lifeline to Chicago taxpayers at the expense of those Downstate. He offered no evidence, however, and academic research has found the opposite is true. Experts we spoke with summed up the claim as a "myth," "clearly not true," and "total nonsense." 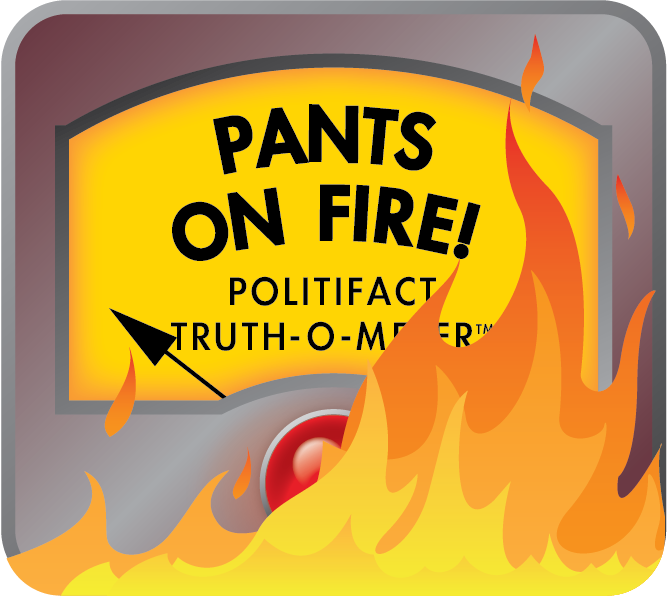 We have a rating for claims that fit that description: Pants on Fire! Published: Sunday, April 7th, 2019 at 3:00 p.m.